Retirement Transitions developed a Medigap quote engine. Individuals are able to enter their information to instantly view Medigap plans and compare prices. Gain access to multiple Medicare Supplement Insurance companies 2016 Plan G and F cost. Our Medigap Insurance Exchange is for Nebraska, Arizona, Iowa, Kansas, Maryland, Ohio, Tennessee, and Texas residents only. If you live in Iowa or Arizona, among other states, please call us toll-free at 1-855-594-0237 to receive unbiased quotes and assistance with Medicare Supplement plans and prices. Comparing standardized Medigap plans in Nebraska will save money while having comprehensive coverage. Nebraska residents who are looking for Medicare Supplement Insurance coverage, follow these simple steps to navigate the Medigap Insurance Exchange. Our online Medicare Supplement quotes has changed. Click here to view Medicare Supplemental quotes online. In the top of your web browser, type www.retirement-transitions.com to get started. Simple so far, right? 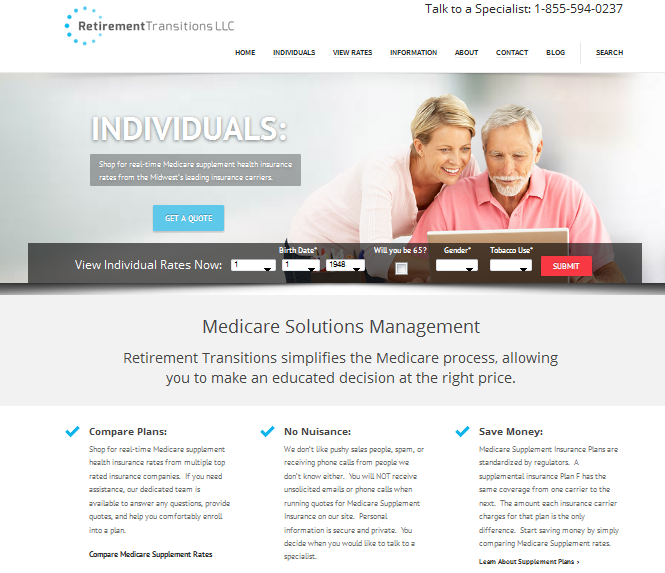 After you click enter, you should see the Retirement Transitions Medicare Supplement Home page. 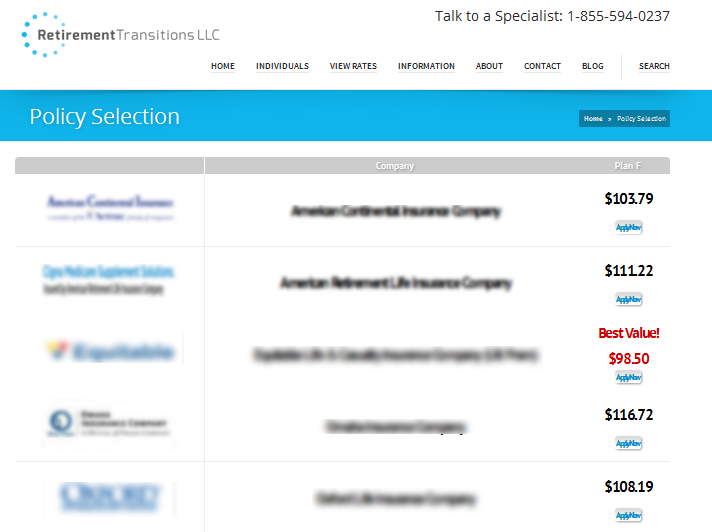 On the main page of Retirement Transitions, navigate to the top of the page. Enter the following information to receive a Nebraska Medigap quote instantly. Use the picture below for assistance. Enter your Birthday. Your personal birth date is one of the most important pieces to receiving an accurate Medigap quote in Nebraska. If you are not 65, select the box between birth date and gender “Will you be 65”. If you are 65 or older, leave the box unchecked. Gender. Gender is another important part to find a Medigap quote. Often, females premiums cheaper than males for Medicare Supplement plans. Tobacco Use. Whether you are a tobacco user or not, you must answer this question as “yes” or “no”. Tobacco Users generally have higher Medigap premiums. If you use tobacco and have guarantee issue or Open Enrollment into a Medicare Supplement plan, call 1-855-594-0237. Our specialist know how to lower your Medigap premium cost. Submit. Move your cursor (mouse) over the red “submit” but and click. If you have entered your information properly and haven’t missed a box, you will be taken to the next page (below). Your almost done, only a couple more clicks and you can start saving money on Medicare Supplement cost. Entering your information to receive personalized Medicare Supplement quotes from multiple companies. They will appear on the screen after you click the “Next” button. After you select next, you will get to review the information you entered to make sure everything is accurate. If everything is accurate, you will be able to start comparing Medicare Supplement rates from multiple companies. Click “See Available Rates”. It’s the blue button on the next page. This has changed. You may receive one phone call from our independent agent. Medigap Policy selection from multiple top Medicare Supplement companies. As you can see in the picture, we show Medicare Supplement Plan F. The ‘best Medigap rates’ will be highlighted in red. The Medigap Insurance companies are blurred for compliance reasons. Individuals will be able to view the companies and Medicare Supplement rates online. Once you are comfortable with a Plan and a Rate, you can “Apply Now” to start the Medicare Supplement application online. If you would like to enroll over the phone, call an unbiased specialist at 1-855-594-0237. Make an appointment with a Medigap Specialist in Nebraska. Evening appointments are available. Let’s work together to get you the most comprehensive coverage at a price you can afford. We are here to help you save money, not spend more. The Retirement Transitions’ Medigap Insurance Exchange offers seniors an easier way to shop for Medicare Supplement Insurance in Nebraska.